Maintaining our urban forest is of upmost importance as our area continues to rapidly transition from farm land to residential and commercial uses. This week I sat down with Ed Kuprel, a forester in Edinburg, to discuss proper pruning practices for our large trees. Without proper pruning, our area trees grow large, low limbs can damage houses and garage structures, make pedestrian and vehicular roads, sidewalks and driveways hazardous to use or block the critical line-of-sight that vehicular and pedestrian traffic need to turn into and out of driveways, streets and sidewalks. 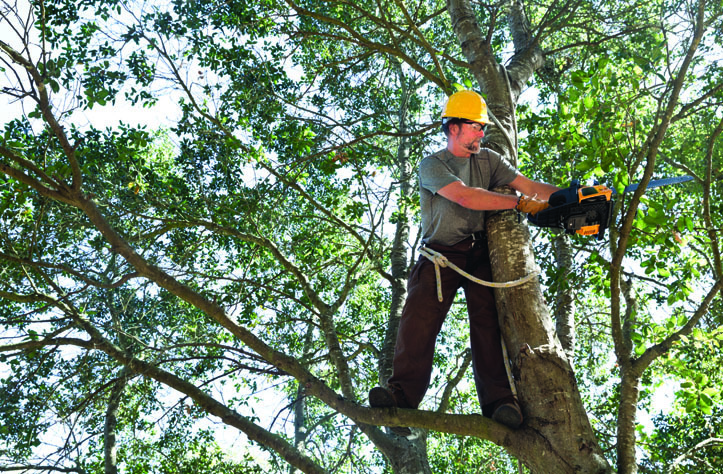 There are easy rules to follow when structurally pruning trees. When you follow these rules you can shape the tree into a desired form and keep it healthy. 1. Locate and encourage one central dominant branch/stem. 4. Do not leave stubs. (When a branch is cut in the middle of the branch and is left open to insects and fungus) Prune back to a main branch — 1/3 the diameter of the cut branch, or back to the main stem or lateral branch. 6. Only leave two branches to a single crotch, if U-shaped, never V-shaped. 7. Do not cut more than 25 percent of the total foliage at one season’s cutting. 8. Always leave at least a 1/2 live crown ratio, preferably 2/3 live crown ratio. The trunk portion without leaves should never be 1/2 or more of the total tree height. 9. Repeat the process one to eight above once per year and keep raising the single leader trunk height by removing more and more of the lowest branches while always only cutting 25 percent of the total foliage each cutting, and leaving, again, over 1/2 up to 2/3 in live crown ratio. You also need to leave the leaves. Sugars produced in green leaves through the miracle process of photosynthesis produce 100 percent of the tree’s food. Cutting more leaves than necessary will weaken the tree’s defenses against harsh weather, insects, disease, strong winds, etc. Don’t starve your tree. 2. LIONS-TAILING: Lion’s Tail Pruning is when all the lower branches are removed, leaving only tufts of leaves and small branches at the ends of the large limbs. This does not leave enough leaves to produce food, so trees suffer from malnutrition, sun burn and increased limb breakage. Reducing the leaves to a small tuft at the end of a long limb catches the wind, often snapping the branch off: http://isatexas.com/lions-tail-pruning/ .